No, Rick Perry did not herald the new Republican party. Texas Gov. Rick Perry addresses the 40th annual Conservative Political Action Conference (CPAC) March 14, 2013 in National Harbor, Maryland. I endorse the Slatepitchy theory behind Michael Catalini’s story about Rick Perry. 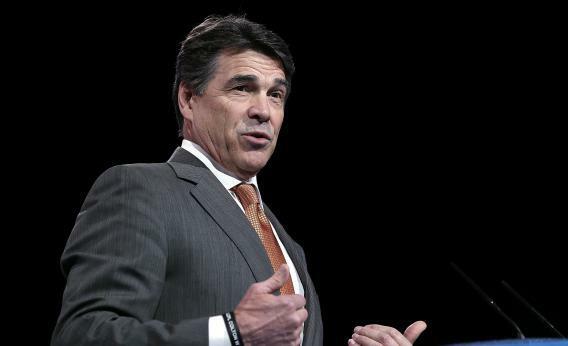 The last time most Americans saw Perry, he was a Peter Sellers sketch, a bumbling Aggie idiot blowing every possible advantage in order to lose the Iowa caucuses and narrowly edge past Buddy Roemer in New Hampshire. So why not ask whether he can come back? If Mark Sanford can come back, can’t Rick Perry? Ha, ha, no. The big problem is that the people praising Rick Perry in this story worked for Rick Perry. We hear from Perry’s former chief of staff (“I think he remains a motivated public official and an energized political figure”), Perry’s former campagn aide (“[Hispanics] see his commitment to inclusion”), a former campaign consultant ("Making a first impression a second time is always difficult”), and eventually a guy who worked against Perry in 2010 but lives in Austin and wasn’t too mean to the guv on Twitter. Shouldn’t a reassessment of Perry’s strength find one person in the broader GOP who agrees that, yes, Perry might be a good candidate in 2016? Maybe that’s not the standard. “It’s striking that [Perry] was campaigning on many of the reforms that Republican Party leaders are now desperately pushing,” writes Catalini. The examples? Eventual GOP nominee Mitt Romney hammered Perry for his support of in-state tuition for undocumented workers in Texas. That was in 2012. Now Republican standard-bearers Marco Rubio and Rand Paul have changed the GOP’s tune on immigration. But have they endorsed the idea of in-state tuition for illegal immigrants? No. Perry also staked out a critical position on entitlement reform, memorably comparing Social Security to a Ponzi scheme in his book. Romney attacked Perry for his positions, but then later tapped Paul Ryan, the Republican leader on entitlement reform, as his running mate. Now Republicans are united on the belief that trimming entitlement benefits is necessary to get the budget under control. But neither this year’s Ryan budget nor the last two Ryan budgets calls for any reform of Social Security. The Republican theory of entitlements, and entitlement politics, is that benefits currently paid to senior citizens should be paid, or plussed up (i.e., reversing the cost reforms and cuts of Obamacare), and people under 55 should have reduced benefits. These were screw-ups that revealed plenty about the GOP in 2012. They didn’t reveal that Perry was miles ahead of the conservative wing.